“Good morning,” the hostess said. A second later, “Good morning,” a waiter said. I don’t know how long it’s been since I’ve gotten two good mornings at a breakfast place. The hostess should say “good morning,” that’s her job, but the other one was a completely unbidden freebie. It’s almost as if they wanted my business! Were happy to be serving food and see customers! Things were off to a good start at Nana, the newish breakfast place in Bridgeport (just down the street from the newly-closed Healthy Food, of whom more in the not too distant future). The place had an attractive combination of blond wood, white paint and sunlight. It was not crowded at 8:30. They were friendly. These are not small things, in the world of Sunday breakfast. Nana is a modern Ameri-yuppie breakfast place with a Mexican slant to the menu— chilaquiles, huevos rancheros, etc. 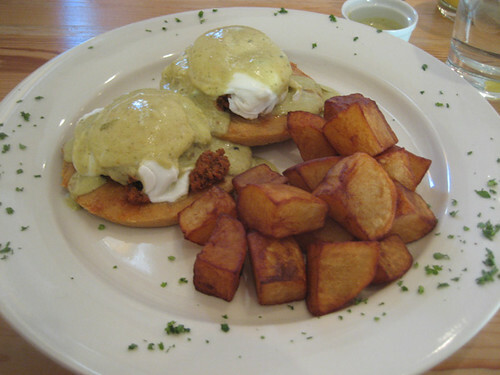 My wife had their take on eggs benedict (pictured above), eggs on housemade chorizo on top of a cheese pupusa, with a poblano cream. This would have been great if the pupusa weren’t cooked hard enough to have to saw through it. I really liked the flavors of the bite I had, the earthiness of the masa crossed with the creaminess of eggs benedict; but the texture would benefit from a dialing up on the Fluffiometer. I had something named Benicio, a potato fritter with housemade pancetta on it. (So if in-house charcuterie is reaching breakfast places, does that mean it’s over as a trend? Because I’d be just fine with it lasting another century or two as one.) This had a chipotle cream with a lot of heat, and it was fine, but not as interesting as the Nanadict. The kids had sweet stuff, and one of them had buttermilk pancakes with spiced apples on it, which was pretty simple and pretty great. Nana is a long ways from me, and it’s probably a long ways from you, but it’s about 10 minutes on 90/94 from me on a Sunday morning, which is no more than a lot of other breakfast places. Anyway, I’ll happily drive it for this warm welcome with no waiting. Post about Lockwood deleted. See here for details (Facebook registration required).